Sam Cosmello had been waiting for this – a game where cramps didn’t shut down his night early. He didn’t play the whole game, but it wasn’t pain that closed his night on the field early, but rather his and his teammates’ success. 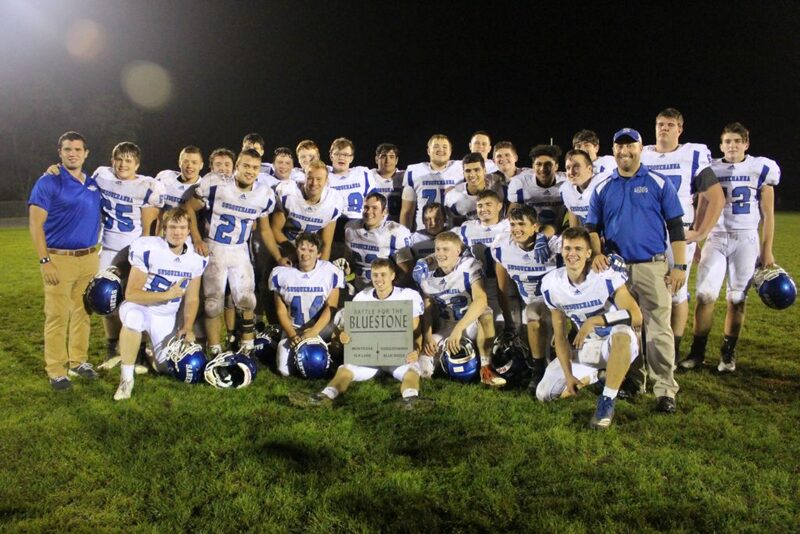 Behind Cosmello’s 99 yards rushing and three touchdowns and seven tackles from his linebacker position, Susquehanna defeated Montrose 36-6 and retained possession of the coveted Bluestone Trophy presented to the winner of the annual football game between Susquehanna County’s only two school sponsored high school football programs. 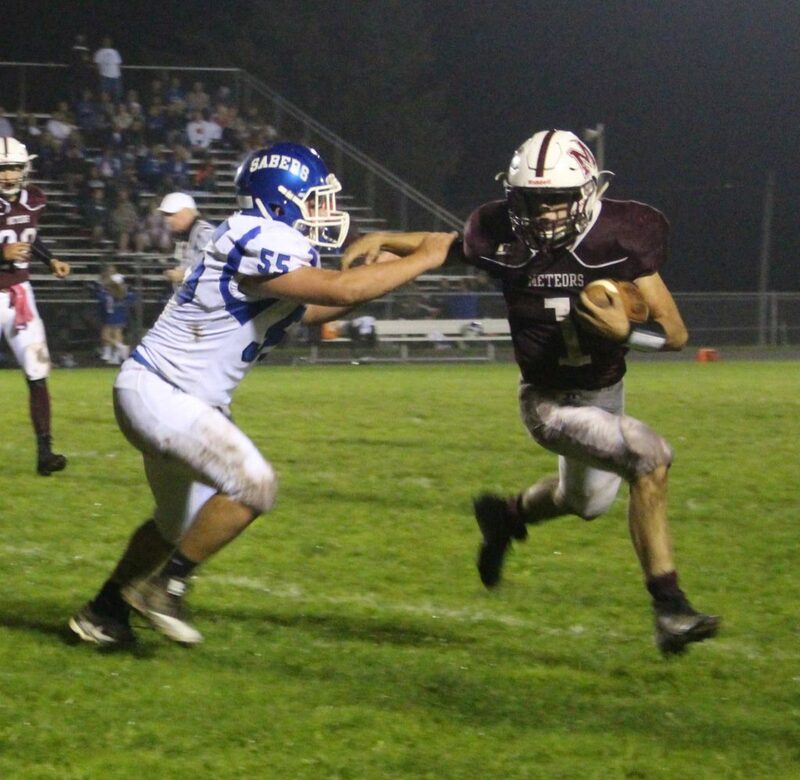 After Montrose went three and out on their opening drive, Susquehanna took over on the 50-yard line and immediately went for the jugular as quarterback C.J. Stone went deep to Peanut Wansley that fell incomplete. On second down Susquehanna nearly ended the drive when an exchange on the handoff went awry and Stone had to pounce on the ball to recover the fumble. From there the offense began to click as Cosmello ripped off 10 yards for a first down on the first of his four carries on the drive. 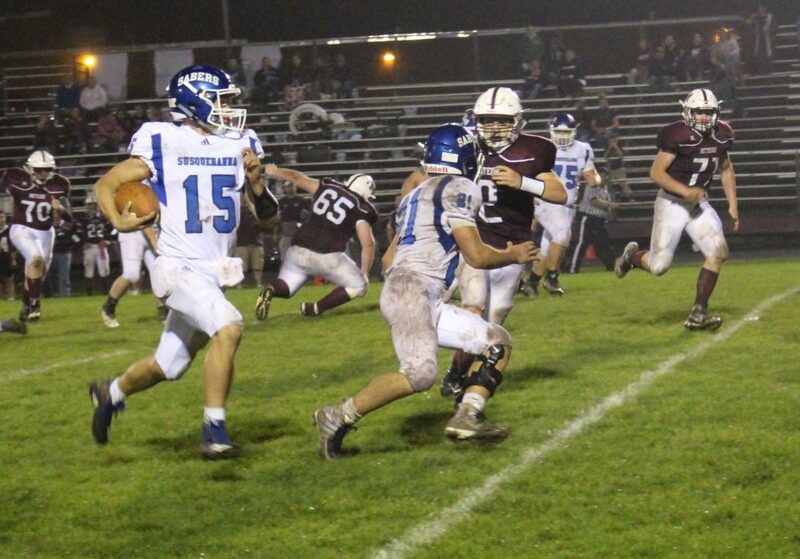 He capped it off with a two-yard plunge and after the kick failed Susquehanna led 6-0. 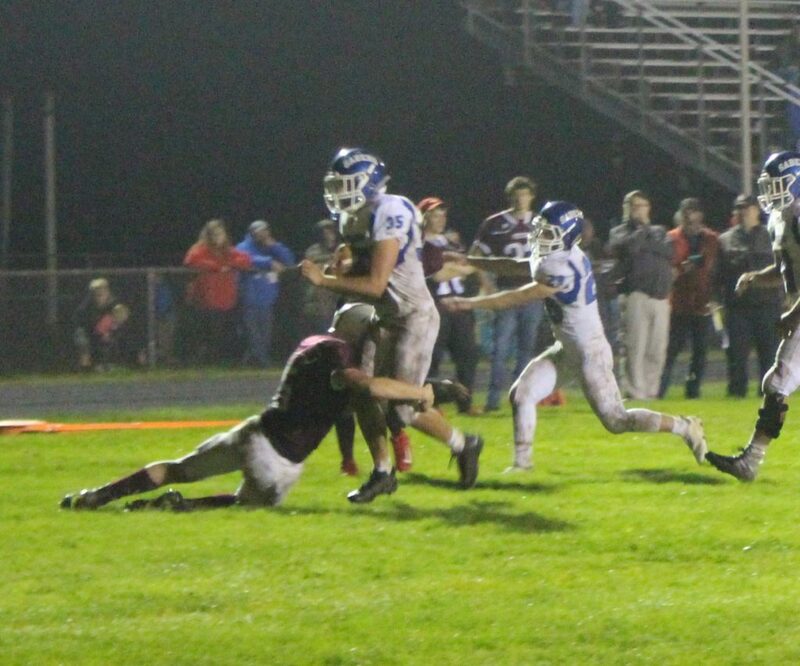 On the Sabers’ next possession, a heavy dose of Cosmello and Stone on the ground was aided when Stone tried to hit Gavin Baker in the end zone. But the Meteors were whistled for pass interference setting up Cosmello’s second touchdown as he burst through for a six-yard score. 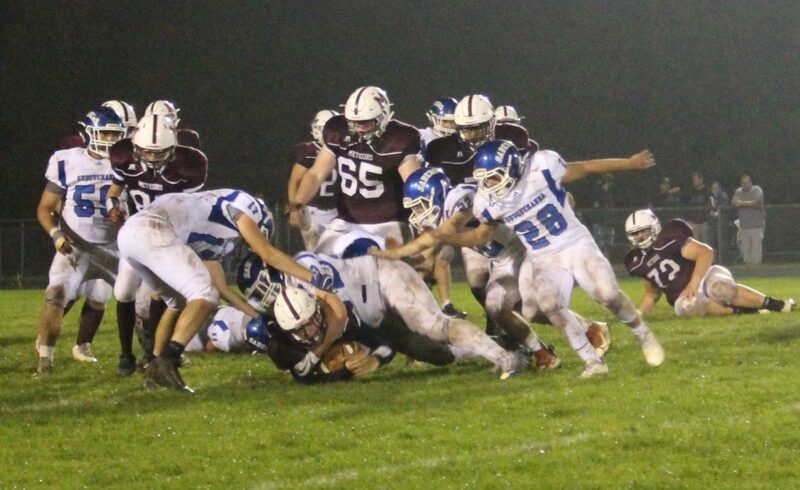 The Sabers went for the two-point conversion and Cosmello delivered with the two-yard rush. “We just really clicked tonight and functioned as a unit,” Cosmello said. tough runs by Michael Brennan and a 26-yard pass completion as quarterback Ethan Cina found Chuck Rohan for the first of Rohan’s four catches. 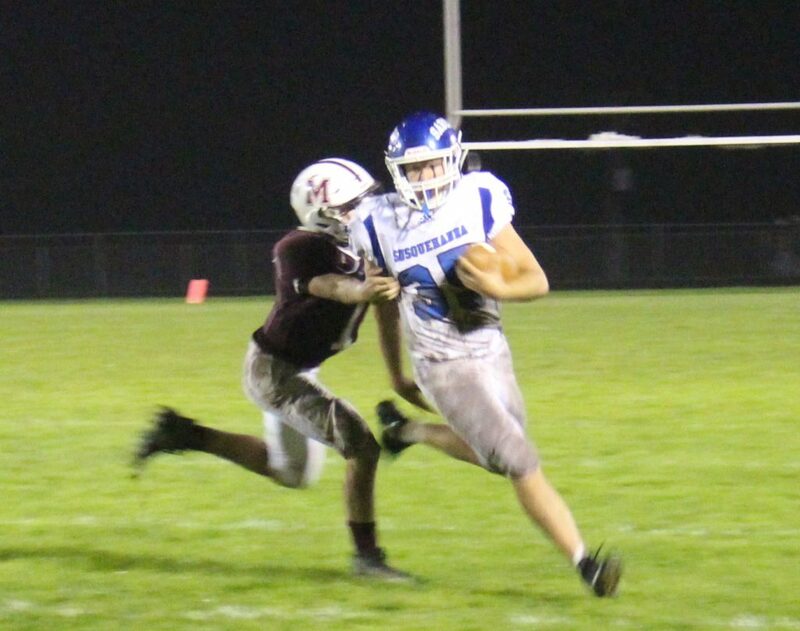 But the drive stalled at the beginning of the second quarter after a mishandled snap and negative yard rush put Montrose in the hole and Cina’s pass fell incomplete on third down. “We have good chemistry, we’ve played together for a long time now,” Rohan said, explaining the success he and Cina have together. The teams exchanged fruitless drives marred by penalties and fumbles before Susquehanna stuffed the Meteors in the endzone to earn a safety. 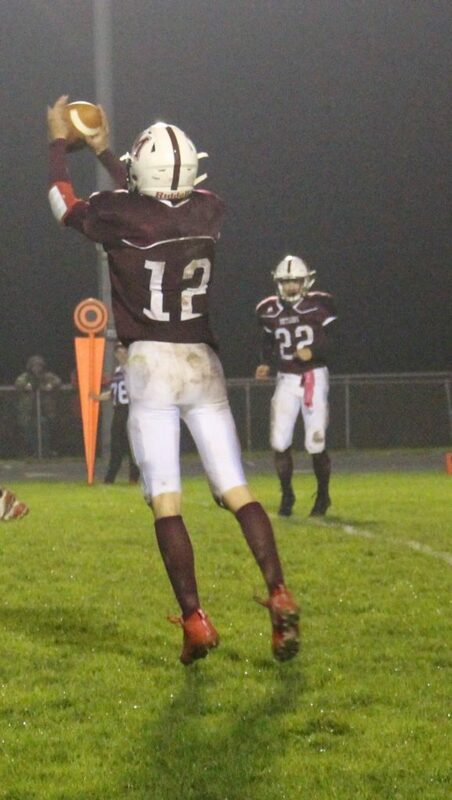 After Rohan’s punt and Wansley’s 10-yard return gave the ball to the Sabers on their own 35, Stone make the call at the line of scrimmage and after a fake handoff to Adam Roe, Stone shot up the middle for 65 yards and the score to send the visiting Susquehanna cheering section into a frenzy. Wansley tacked on the extra point and Susquehanna held a commanding 23-0 lead. Montrose responded despite the deficit. 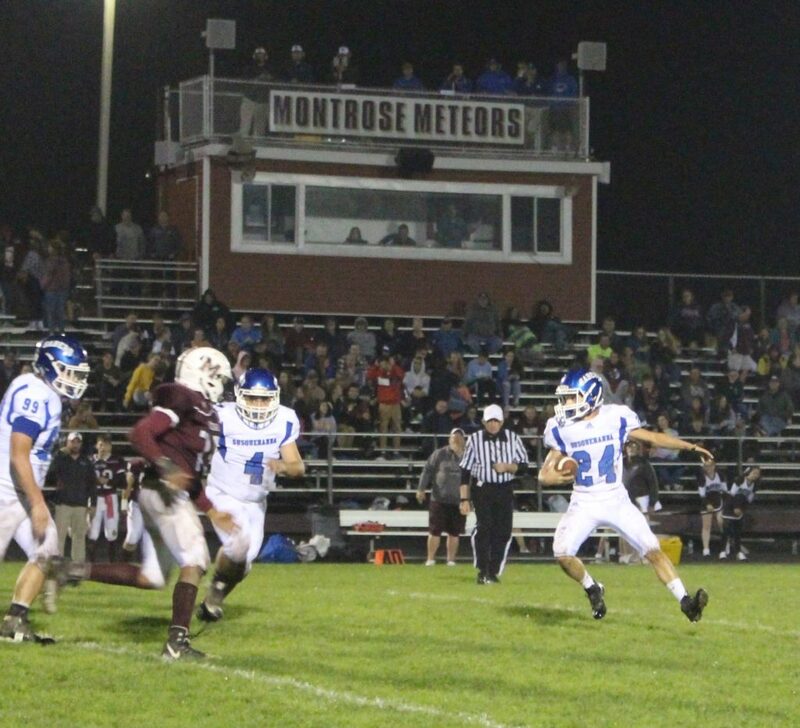 Kanna return the kickoff 24 yards and a personal foul on Susquehanna gave Montrose the ball on the Sabers 40. On the first play, Cina just missed Rohan for a possible touchdown and after Brennan’s four-yard run the drive appeared stalled when Gavin Baker sacked Cina in the backfield after miscommunication on the handoff and Cina’s pass on fourth down fell incomplete. 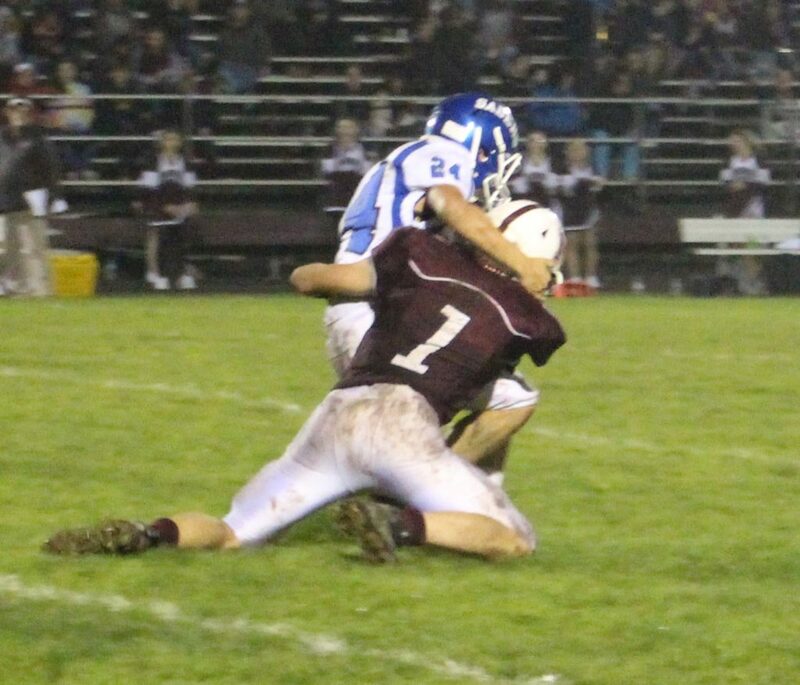 Susquehanna was called for a 15-yard personal foul to sustain the drive. 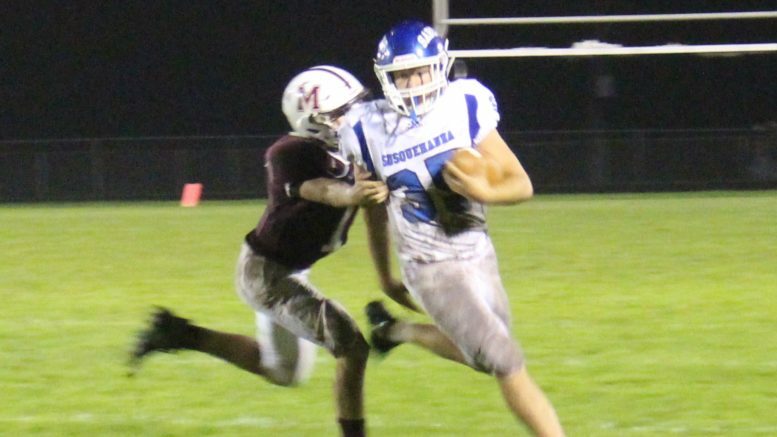 After a couple of tough inside runs by Brennan and fullback Darrin Mpintos, Susquehanna accrued another penalty and Brennan capped off the drive with a three-yard touchdown run to give Montrose some life with just over a minute to play in the half. The pass failed on the two-point conversion. “The whole team loves the game,” Rohan said, in response to how Montrose was able to recover from the deficit and focus on the scoring drive. 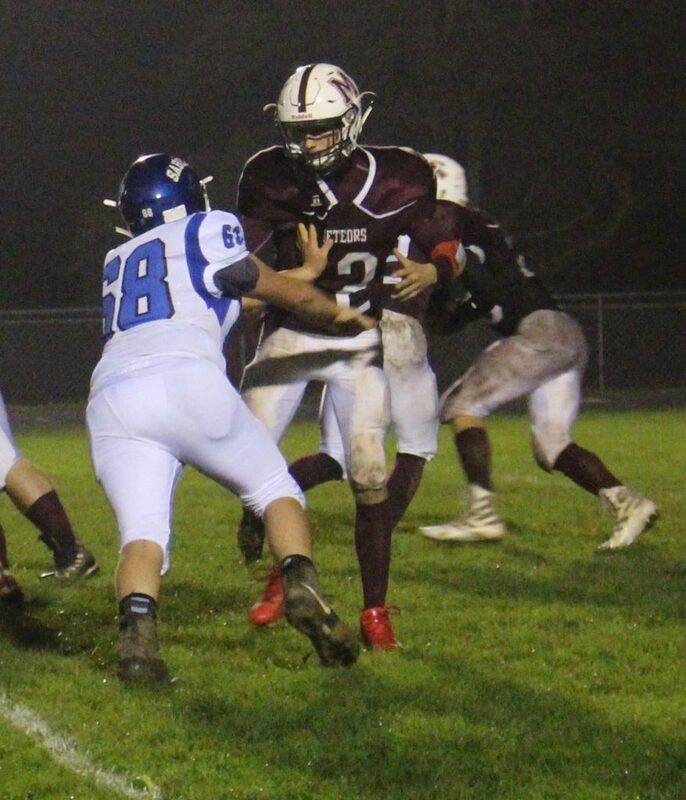 The Sabers nearly scored again before halftime, after going three and out on the ensuing possession, Kanna fielded Wansley’s punt and was hit hard forcing a fumble that sophomore Ryan Koziol pounced on to give Susquehanna another chance before halftime. After an incompletion Stone hit Baker for a 30-yard gain with nine seconds left. But Baker fumbled on the run and the Meteors recovered to end the half. 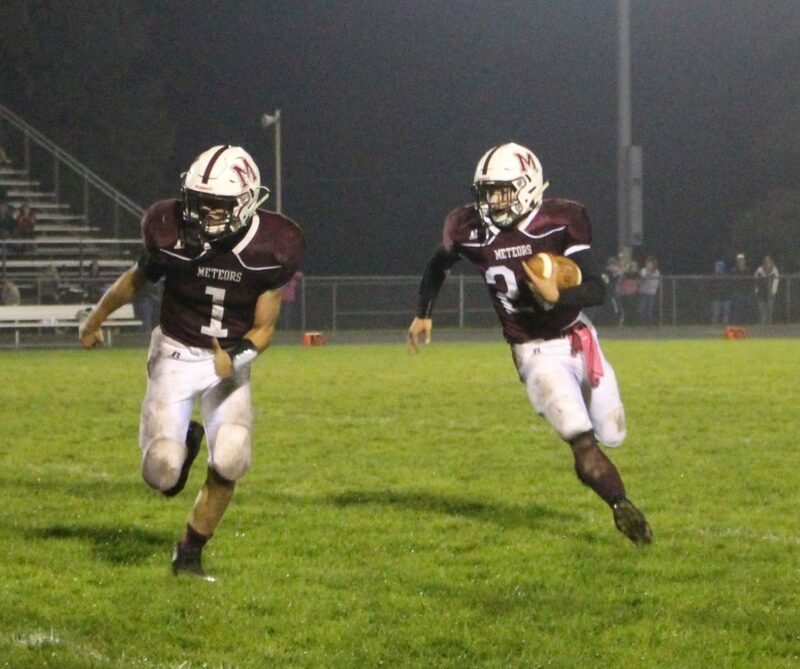 Susquehanna opened the second half with a methodical five-minute drive that Cosmello capped with a one-yard scamper to the endzone. The kick failed, but four minutes later William Perry found his way to the endzone from 10 yards out and Wansley tacked on the extra point to close out the scoring 36-6. Susquehanna would rest its starters most of the fourth quarter. Cina and Rohan would hook up two more times to bring the Montrose faithful a little excitement, but the Meteors couldn’t find the end zone in the second half. Missed opportunities haunted Montrose most of the evening. 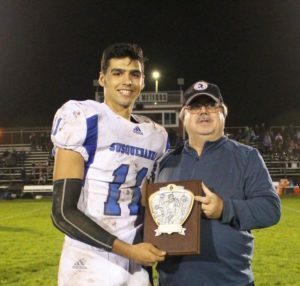 Saber sophomore Baker was awarded the fourth annual Thomas E. Robinson Memorial Award, given to the player who combines outstanding play in the game while showing respect to both officials and his opponent. Baker finished the night with one reception from his tight end position and, on defense, wreaked havoc amassing six tackles, three accounting for 12 yards lost and a sack for a nine-yard loss. 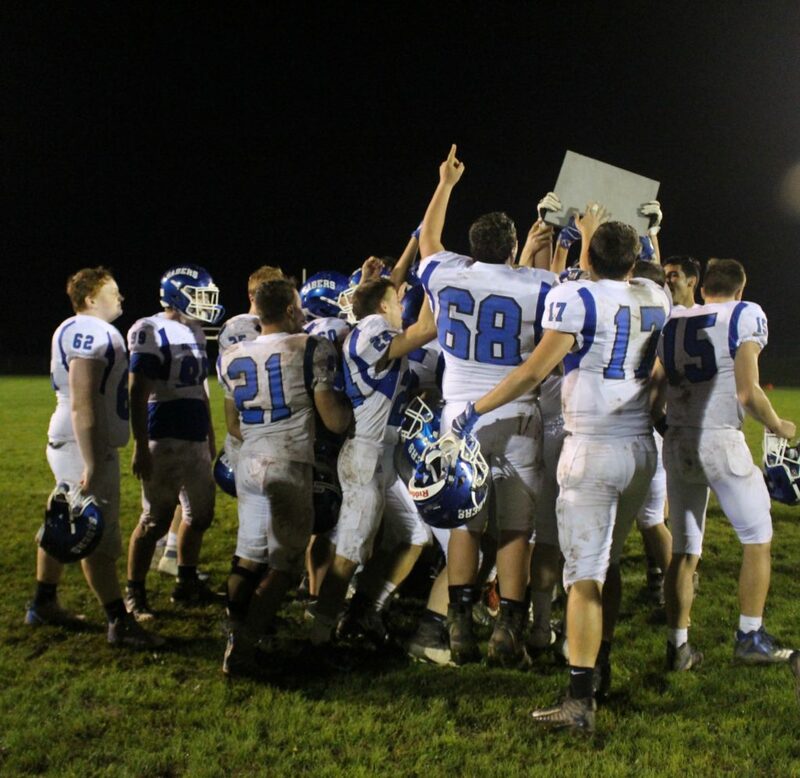 The senior-laden Sabers gathered with fans and family at midfield after the game to celebrate the return of the Bluestone trophy to Susquehanna’s hallways for at least another year and the moment was not lost on the seniors. 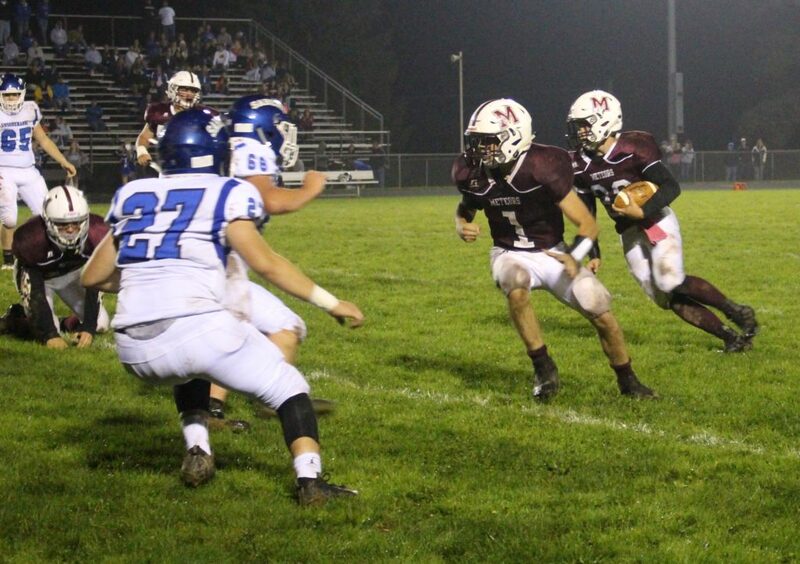 Montrose moves forward looking for that elusive first win, and will travel to Carbondale on Friday to face the winless Chargers. But team morale remains high and the players are focused. Coach Miller hopes to have some of his injured players back to full strength. “We need to practice hard all week and come into the next game confident and play as a team,” Rohan said. “We just keep pushing each other to get better, it’s been a tough season, but we keep fighting,” added Cina. 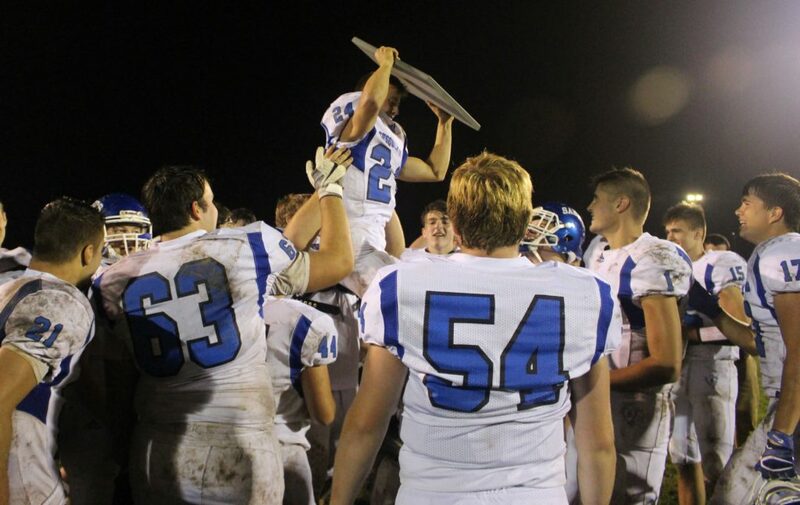 Be the first to comment on "Sabers win Battle for the Bluestone"